Bishop Gunner was bon in 1152 and educated at the University of Paris. in 1208 he entered the Cistercian Abbey of Øm (Cara Insula), and became Abbot in 1216. He was elected Bishop of Vibord in 1222. He probably wrote out the Jydske Lov (Law of Jutland) and composed the original preface to it. He was present when it was published at Vordingborg in 1241. A “Ting” in Norwegian is an assembly. The Gulan Ting, the oldest public legislative assembly in Norway was established in the first quarter of the 10th century. It developed an oral law code known as the Gulating Lov. It was probably not written down until late in the 11th century. The earliest preserved fragments of the law code are from the late 12th or early 13th century. The only manuscript of the entire Gulating Lov is dated around 1250. It is preserved in the University Library in Copenhagen. 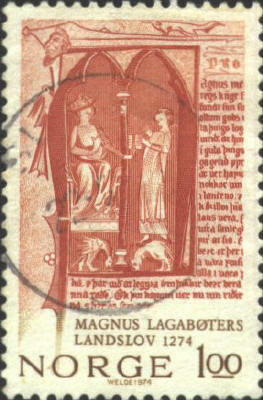 In 1274 King Magnus Lagabøte (the Law Mender) produced a national code of laws for Norway called the Landslov. It was based on the regional law codes including the Gulating Lov. 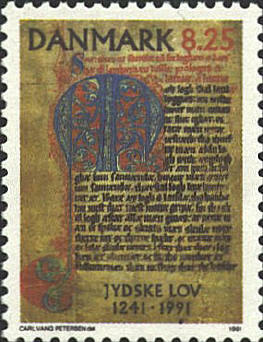 The stamp commemorates the 700th anniversary of Magnus Lagabøter’s Landslov of 1274 with a page of the Gulating Lov manuscript, which the Scott catalog dates to 1325. 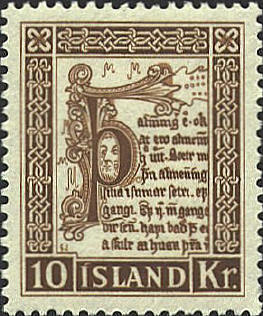 The Seyðabrævið (Sheep Letter) is the oldest law code in the Faroe Islands. It regulated land use and economic affairs generally. It include regulations for whaling, the use of land, the protection of small farmers, runaway servants, and the capital necessary to set up a household. It continued in effect until a new code, which included many of its provisions, was passed in 1866. 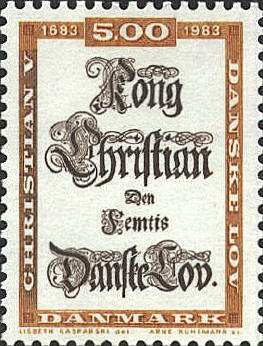 The foundation of Danish statute law was promulgated by King Christian V. A Norwegian versions was provided in 1687. Among its provisions is one which states that the church is tied to the three Ecumenical Creeds, Luther's Small Catechism, and the Augsburg Confession. Another prohibits Jews from entering the country and provides a fine for anyone who broke this law, and a reward for the person who informed against a Jew. A hundred and thirty years later the newly adopted constitution of Norway stated that the official state religion was Lutheran, and also forbade Jews and Jesuits from entering the country. 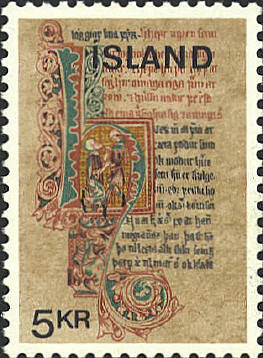 An initial from the Skarosbók, a law book from 1363. An initial Þ, "thorn," from a law manuscript.